HOMESTEAD, Fla. — The underwater world of Biscayne National Park doesn’t just benefit from the generous sunshine that brightens its sky blue waters. Within the waters, there are various bright arrays of color gracefully swimming aimlessly, but resolutely. Home to an abundance of different species of fishes and other curious creatures, they are not shy to traverse the open water wonderland. 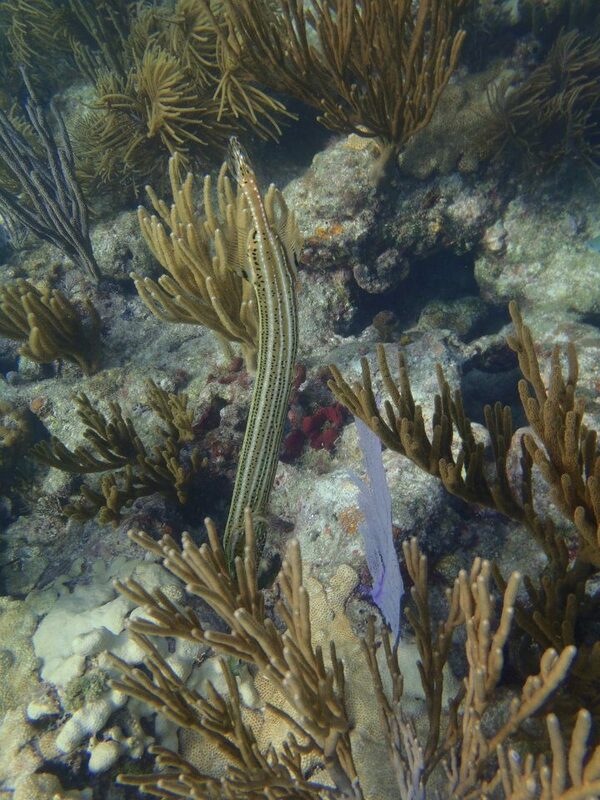 It is in these waters that offer the most colorful schools of fishes, a dazzling display of marine wildlife. 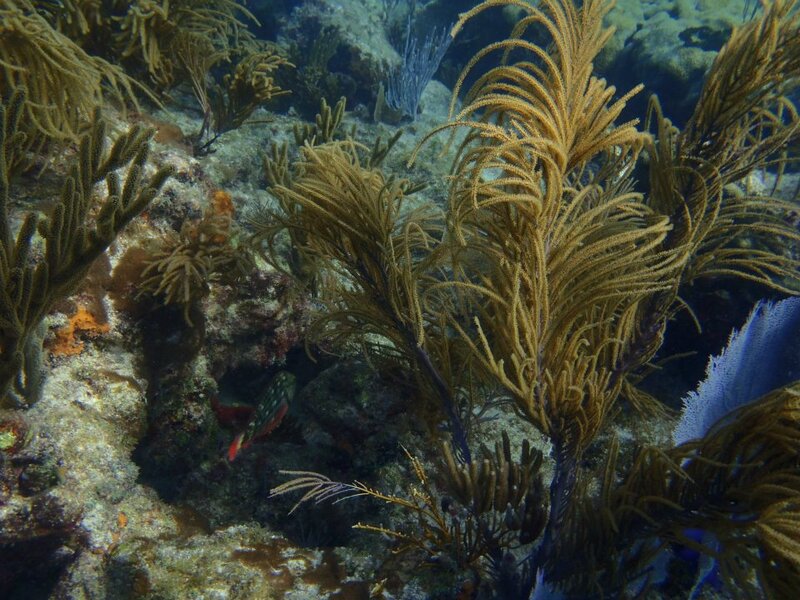 A look at the underwater life of Biscayne National Park (Photo by Marcus Lim). This unusual national park is the stereotypical imagination of what a person thinks of a perfect bay. Clear, blue water. The bright yellow sun. A vast, cloudless sky. An atmosphere of tranquility, a place to be immersed in nature and relax. A prime spot for many locals and both domestic and international tourists, the pristine, vast marine wilderness, located along the southeast edge of the Florida peninsula, was established as a national monument in 1968. Today, the 173,000-acre national park, of which 95 percent of the total area is underwater, serves as a protector and a home of the rare combination of terrestrial and undersea life. 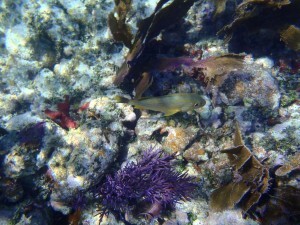 Biscayne Bay fish display vibrant colors (Photo by Marcus Lim). “In variety, in brilliance of color, in elegance of movement, the fishes may well compare with the most beautiful assemblage of birds in tropical climates,” Louis Agassiz, a 19th century naturalist, wrote after visiting the Florida reefs. It is the paradise of marine life that sets the park above others and still continues what Agassiz saw 200-plus years ago. It is what makes the area have a constant flow of people visiting the landmark. Hosting various keys, shallow bays, coral reefs and a mainland mangrove shoreline, the subtropical place is home to the schools of elegant fishes that demand people’s attention. Fish scoot around in Biscayne National Park (Photo by Marcus Lim). A dazzling spectrum in the ocean is truly a spectacle to behold. Resembling a field of wildflowers or the glittering city lights or a desert sunset, the reef fish seem to emulate these colors. It is in the sun-splashed waters that hosts more than 200 types of fish. Ranging in sizes from less than an inch to beyond 10 feet, to different colors, shape and sizes, some fishes have characteristics that seem bizarre to humans. Whatever it is, the diversity of life is plenteous in the 270-square miles park. From the flamboyant angelfish, blenny, parrotfish, arenatus, eels, lizardfish and various others, there is no shortage of the ordinary and extraordinary. The unique color each fish has a range of habitual reasons. 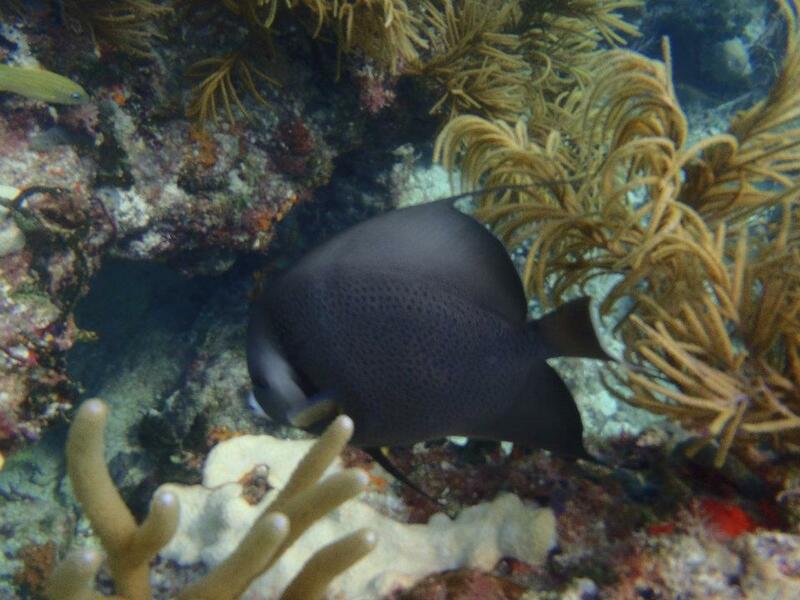 The queen angelfish has color that advertises its presence, to attract a potential mate. Wrasses that are vividly colored attract others to clean them of parasites and dead tissue, which in turn allows them to eat heartily off them. Some are masters of disguise, using their colors to blend into the background to camouflage themselves from predators. 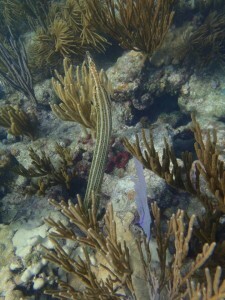 An eel swims in Biscayne National Park waters (Photo by Marcus Lim). Navigating the waters can be treacherous for the fish, so it is very common to see schools of thousands darting around, moving with precision and in unison. Others, such as the solitary angelfish, like the name implies, swims alone, freely with a deliberate grace. The coral reefs thrive in the waters. Unlike the dark, lifeless ocean depths, the shallow waters in Biscayne are populated by blooming corals, with plenty of light to steal from the sun. Populated inside it are an array of colorful tropical fish and other curious creatures. Some of them, like the sharp-beaked parrotfish, loves munching on coral. An odd meal for a fish, but it is really the algae and coral polyps it is after. With a Caribbean-like climate, the warmth, lavish sunshine and plentiful rainfall serves as the ideal environment. It is these waters that the fish of Biscayne can proudly call their home, a home that other marine life may even be envious of. For divers and snorkelers in Biscayne National Park, the underwater scenery seems limitless (Photo by Marcus Lim). The public has long found Biscayne very popular. Not only to witness the wildlife, it serves as an outstanding recreational area to be engrossed in water activities. From boaters, anglers, snorkelers and divers, they can take comfort in the refreshingly clean waters with extraordinary visibility. It is this inviting waters that see many fishers come by to see what prize they can get. It is because of this that unfortunately, some of the beauty of Biscayne is in peril. Over-fishing threatens the native species and while as a national park, it is committed to preserve and protect endangered species and encourage fishermen to fish native species in their natural environment, there are some who ignore the rule. 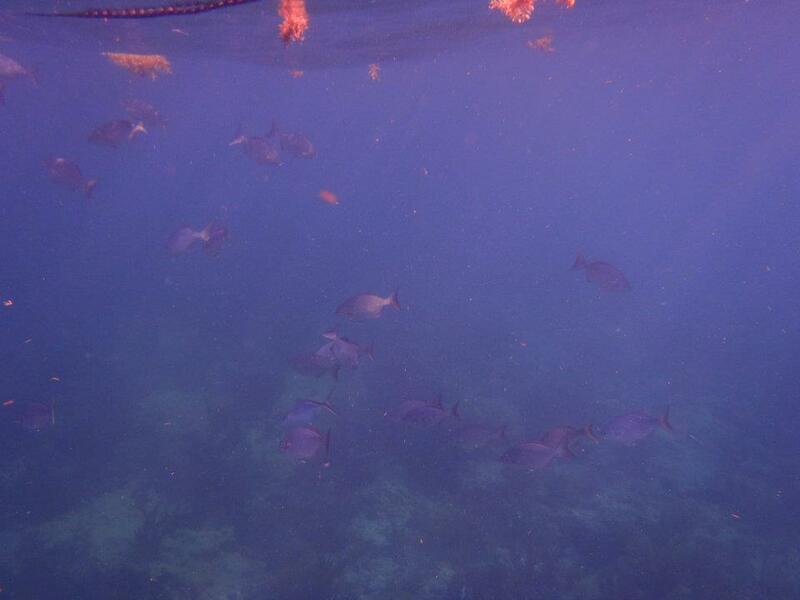 Despite threats of overfishing, the sanctity of the fish hope has been unspoiled to the human eye. The same exquisiteness still exists. For those traveling there, expect to be wondered by the beauty that is hard pressed to find anywhere else in the world. And be dazzled by the natural splendor that Biscayne National Park’s waters can offer. Hours: 24 hours every day. Convoy Point daily from 7 a.m. to 5:30 p.m. Dante Fascell Visitor Center daily from 9 a.m. to 5 p.m.